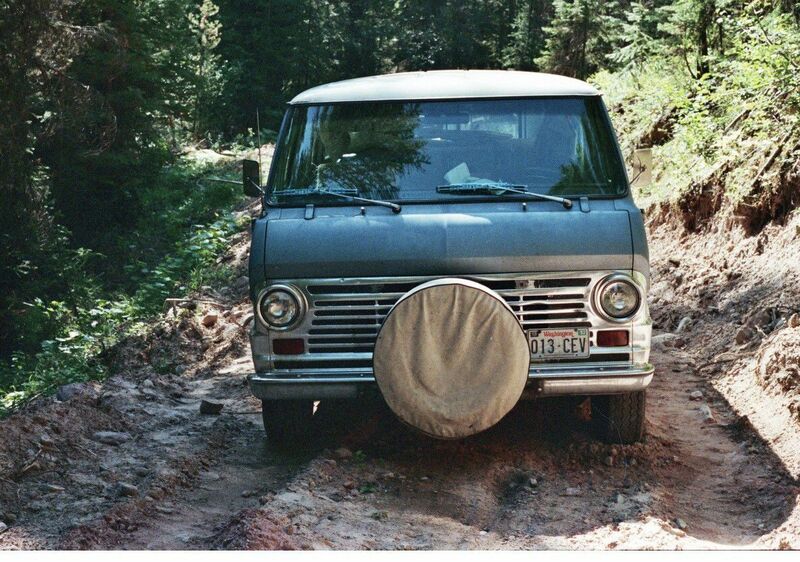 A 1991 photo of the Cheethams' van found near Lake Alva. Authorities, who announced April 11 they are reopening the unsolved murder case, believe the van was moved after the couple was killed. Cold case investigators, retired federal officers Susan Lane, center, and Diana Park, answer questions at a news conference Thursday morning as the Missoula County Sheriff's Office announced it was reopening an unsolved homicide from 1991. Map indicates where the bodies of Kenneth and Iva Larue Cheetham were found near Lake Inez, as well as their van, located on a new logging road two miles north. Authorities believe a Hitachi camcorder was taken from the Cheetham's van after the couple was killed in 1991. The camcorder may be a crucial bit of evidence in solving their killings, Missoula County Sheriff T.J. McDermott said. Iva Larue and Kenneth Cheetham, found shot to death near Lake Inez in 1991, remain on the list of victims of unsolved murders in Missoula County. Cold case detectives on April 11 announced they are reopening the case. Two retired federal investigators now committed to solving Missoula County cold cases have taken hold of the 1991 killings of a Washington couple north of Seeley Lake. Introduced to the public for the first time Thursday, Diana Parker and Susan Lane have reopened the probe into the homicides of Kenneth and Iva Larue Cheetham, whose bodies were found — after they had been missing for more than a month — with fatal gunshot wounds near Lake Inez in the summer of 1991. Missoula Sheriff T.J. McDermott said in a press conference Thursday that Parker, a former FBI investigator, and Lane, former investigator with U.S. Homeland Security, have been reviewing the case file and interviewing family members on volunteer time as they begin investigating the Cheetham deaths. McDermott said the Sheriff's Office is hoping new technology and assistance from the public will bring closure to the family, if not the killer to justice. "We believe people who are familiar with the circumstances surrounding this case remain in our community," McDermott said. "Law enforcement is aware that there is information that has not been shared. Authorities have identified persons of interest, Detectives Capt. David Conway said Thursday. Law enforcement has had such suspects in the past, although no arrests were ever made. "It is sometimes the case that people who may have knowledge don't initially come forward because of their relationships to the people involved, concerns for their safety, or they may not realize information that they had is important," McDermott said. "We recognize that relationships change over time as do people and their perspectives. "It is not too late to come forward." Kenneth Cheetham, 60, and his 55-year-old wife Larue left their home in Washington state in late July that year to visit Glacier National Park. He was employed by the Sonoco Products Co., and she a homemaker, according to a piece in the Missoulian after their bodies were found. "They had been to Glacier Park several times before but never from the Swan Valley," Parker said Thursday. "They were looking forward to that." The couple were seen in Missoula, and witnesses had recounted their vehicle passing through Clearwater Junction on July 30, according to reports. Family members reported the couple missing when they had not stopped in Spokane to visit relatives as planned. On Aug. 5, the couple's van was found on a new logging road near Lake Alva; Larue Cheetham's purse had been dumped out inside the van and a pair of shoes she bought in Missoula was found outside the vehicle. The van's key was found not far down the road. Authorities deployed search parties by ground and air on Aug. 12, 1991, and by Aug. 30 Missoula County lawmen said their best hope to recover the Cheethams lay with early-season hunters who might come across the bodies, possibly dumped or buried in the woods. But a man walking his dog came across the bodies, the Missoulian reported then. On Sept. 11, 1991, the man's dog took off into the woods, returned and led the man to the bodies, then-Missoula County Sheriff Doug Chase told reporters. Kenneth Cheetham was shot once in the chest. His wife died of one gunshot to the head. At the time, Sheriff's Capt. Gerald Crego told reporters 9-millimeter casings were found near the bodies. But the bodies were found in a popular shooting area, so the casings may have been fired before the killings. Authorities interviewed dozens of people but made no arrests in the following months, according to Missoulian reports. The next year, Missoula detectives believed they may have found a connection between the killings and a Florida man, Lloyd Wayne "Buddy" Allen, who was suspected in the November 1991 murder of a woman in Key West, Florida. Allen had been in the Missoula area in the months before the slayings, possibly during the time the Cheethams were robbed and killed. But no evidence definitively tied Allen to the Montana crime. One piece of evidence relevant then and today was found a week after the bodies were discovered, and many miles away: a video camera strap that belonged to the couple, or at the very least had "Cheetham" written on it, was found on Highway 90 between Fort Benton and Geraldine. "A Hitachi VM-5200A video camera and case was stolen from the victims' van either by the killer or killers or possibly by individuals who moved the van," McDermott said in a statement Thursday. "If you saw, acquired or know someone who acquired a Hitachi camcorder in the summer or fall of 1991, we are asking you to contact us. The camera may have been pawned or sold and the person who ultimately acquired the camera would have no knowledge about its origins." Authorities at the time combed through pawnshops and followed other leads to find the camera, Lane said, but without success. Lane and Parker both said they were impressed with the work done by detectives at the time, but acknowledged law enforcement has more tools at their disposal these days. "Even though the camera might be gone, the lead is still there," Lane said. McDermott said additional evidence found "on and near" the bodies is also under new review. Technology, specifically the advancement in DNA and genealogy, and new investigative techniques will likely be instrumental in moving the case forward after nearly 30 years. "What is the kind of new technology or techniques available to look at the evidence collected back then that can give us new leads or additional leads now?" Lane said in speaking about their approach to the case. Parker and Lane have been in contact about this case with the Montana State Crime Lab, the FBI and ATF about new techniques to apply to it. While a number of cases remain open at the Sheriff's Office, Capt. Conway said the amount of evidence already collected in this case presented opportunity to close it out. "We knew this was one of those cases that had some evidence collected, that now, technology may give us the opportunity to look at it in a different light," Conway said. McDermott's statement in full can be found on the Missoula County Sheriff's Facebook page. Anyone with information regarding the van or the deaths of the Cheethams is asked to contact the Missoula County Sheriff's Office on Facebook, Twitter or the tip line at 406-258-3302. An earlier version of this story misspelled Diana Parker's last name. The story has been updated.